Contrary to the opinions of many inexperienced professionals, a win-win resume entails a great deal more than just an overview of your qualifications. Instead of acting as a mere listing of one's academic and practical milestones, a nifty curriculum vitae ought to sell the applicant as the ideal package that would-be employers seek. Nonetheless, not everyone can muster an exciting turn of phrase that sets them apart from the clutter. As such, you may select a more seasoned writer to assist you to successfully scale this understandably lofty hurdle. Continue reading to discover the top 5 tips for choosing a freelancer to help portray you as a candidate terrific distinction through a masterfully crafted career profile. 1. Decide Where/How to Hire a Talented Freelance Writer – Offline or Online? First off, it's essential to deliberate on the question of where or how you'll get the best writer who will pen you an inimitably proffesional resume profile. Since gifted authors aren't quite common, you might have an awfully hard time sourcing these undeniably rare literary doyens locally. All the same, you may still seek honest referrals from a large number of your acquaintances/friends, former classmates, or even relatives. However, you're sure to find top-rated writers over the web. Given the fact that it's incredibly easy for virtually every other quack to market themselves as competent men/women of letters, your only saving grace lies in your choosing to outsource from creditable internet platforms. Never be sidetracked by lone wolfs posting independent adverts on any white space on the web. As a fail-safe precautionary measure against getting easily beguiled by the many impostors slyly self-styled as practiced authors, take the much wiser direction of hiring individuals on internet-based freelance writing hubs. On almost all freelance writing websites out there, admins have a crystal-clear method of awarding distinctive client-focused ratings so as to differentiate every freelancer's meritorious abilities. For instance, a typical site might classify eligible users into four tell-tale competence categories – E.g. Basic, Premium, Elite, Excellent(Elite-Plus). Make sure that you understand all the rating criteria before choosing the best specialists. Sometimes you may even set up an article request within a given skill category on such platforms. You really don't have to pin-point specific names as long as you've placed your write-up request within the highest competence echelons, like Excellent(Elite-Plus). Although the individual you contract to come up with an expertly woven curriculum vitae may be a real fiend at authoring career profiles, you pretty need to be unambiguously clear as you put up a request. Note that your gross failure to unambiguously state what you want them to do may still work against your worthy efforts. Therefore, remember to articulate all your fundamental demands and overall personal expectations before you create the order for bidding. Bear in mind that it's equally inhumane to have to reject someone's best attempt while all insufficiency hinge's on your naive omission of critical writing instructions. Finally, it might prove incurably hard to come across thoroughly baked resume mavericks even on the most well-reviewed professional writing sites. In fact, this all the more likely due to the irrefutable truth that not all capable writers may have the requisite knack to quickly design an insurmountably appealing professional and personal presentation as desired by top-cadre bosses and interviewing panels. As such, it's quite prudent to run a few interrogatory background checks prior to hiring any potential writing guru. For example, you may ask a promising choice whether they've carried out similar tasks in the past. If they indeed have, request to have a telling peek at their specimen script so as to judge their basic eligibility for the project at hand. Summarily, it's pretty advisable to contract others to compose a thrillingly outstanding resume if you aren't a painstaking able author yourself. Nevertheless, the top 5 ideas highlighted in the foregoing paragraphs may not suffice to get you a fully baked resume composer. 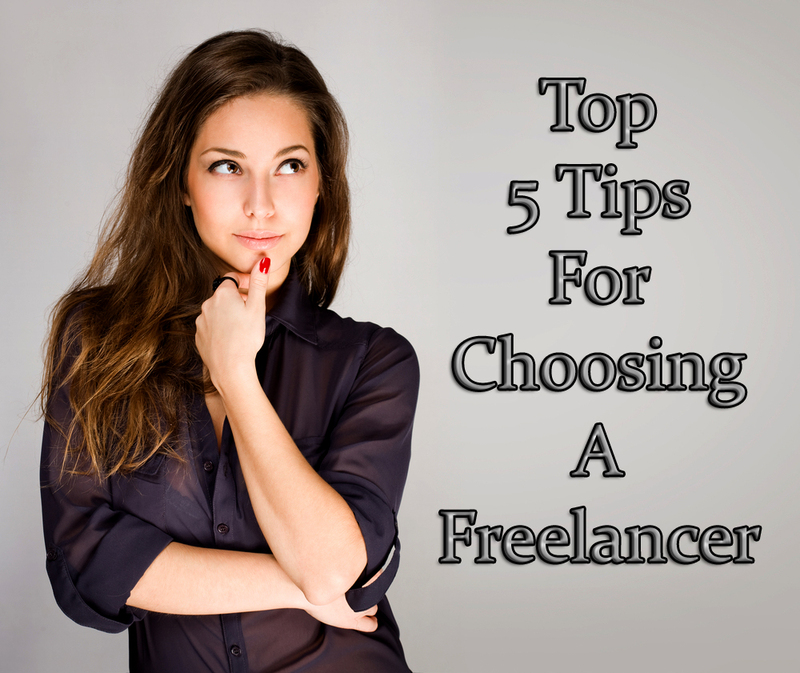 Subsequently, these useful guidelines shouldn't be the only tips for choosing a freelancer to help portray you as a candidate worth a well-paying employer's favorable consideration. They're merely helpful steps that ought to be coupled with other insights such as running localized/printed adverts. These are good tips for anyone requiring a freelancer of any kind. As a freelance writer and editor, I keep my website’s Porfolio up-to-date, and constantly add more client praise to my Testimonials page. My extensive experience speaks for itself, and whenever I need to hire writers to help me, I look for those who have excellent writing skills. I also conduct tests of my own. That's greate. I'm also doing the same and when need any writer for my sponserd post I will check the gramaticall skills because in writing grammer's matter lot. Some writer have good skills but poor in grammer and synonyms. Updation is very much important for the survival in online world. Thanks for sharing your thoughts. Keep coming. These 5 tips are effective, but what If I have to hire any freelancer from the Fb groups instead of the top sites. Because they demand the high price as per the article instead of the other freelancer which are working from the Fb Groups. Thanks for being a regular reader and commenter of my blog. Keep Coming. Your comments are expected. And sorry for late reply. Amazing article posted by you, yes! agreed with Junaid, really it is hard to identify online an individual freelancer weather he/she is good or not for our blog or website. But to hire offline or from an agency would be better option. Nirmal your 5 tips are really an informative and helpful. Thanks to share this infomation. Keep posting such blogs. Thanks for your appreciation. Yes. I also agree with the points of Junaid. Keep Coming. Your thoughts are welcome.